I know you love that Austin-And-Ally-like title. I totally didn't copy WisteriaMOON. Why do people type it " WisteriaMOOOOOOOOOOOOOOOON"!? She doesn't hold out the "moon", she just screams it! MOON! But, it doesn't quite work for my username, so let's move on. I'm terribly sorry, you guys. This is an Animal Jam blog, and I've been posting less AJ things than I'd like to. Well, okay, my most recent post was about AJ. But still. Not to mention I broke a promise. I said I'd post on the weekends, but guess what? I didn't. I'm so sorry, everyone! I was just so busy! I was going to post yesterday, but a school project kept me up and away from the computer until about 2 AM! (I go to bed later than most do.) At that point, there was no way I was gonna be able to get online, and even if I could, I have blogs to check before I play on AJ! So, again, I'm terribly sorry! I hope you all understand! Let's be honest, though, I bet you do! ;) I'll be trying to post more AJ related things, and post more often! 2. 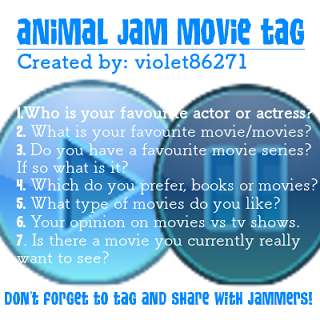 THE JUNGLE BOOK (newer version), HOTEL FOR DOGS, ZOOTOPIA, AND HUNGER GAMES!!!!!!!!!! 3. Movie series? No, I do not watch movie series, sadly. Overprotective parents+2 younger siblings= absolutely no privacy. 4. Well, I like them both! Like a blogger has stated before, books are better if you want to get to know the characters better, and movies are great for action! Plus, movies kinda make you feel like you can relate more, ya know? So I guess I'd have to say it's a tie! 5. I like comedy movies, mostly Disney or whatever. I do like Hunger Games, though, because of the action, and the plot is amazing! 6. Movies are usually more action-filled, and I like that. But TV shows last longer, and they're sometimes funnier. Again, tie. Oh! I was gonna say no, but I just thought of one! Okay, so it's not being released anytime soon, but I WANT THAT WARRIORS MOVIE!!!!! 1) Oh gosh, I CAN'T CHOOSE!!!!! 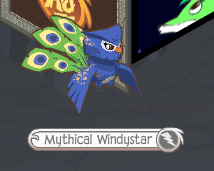 Either the Rare Party Hat, Rare Wings, or Peacock Feathers, I suppose. 2) Obviously, it'd be Buddies and Masterpieces! 4) I have 80 already, but if I had more inventory space, I'd spend them all on Masterpieces. Maybe some armor and giant plushies, too. But, I'd also love to see the land UNDER Appondale become a lush, green rainforest! Wouldn't that be amazing!? Thanks to GRACIE and VIOLET for making these tags! 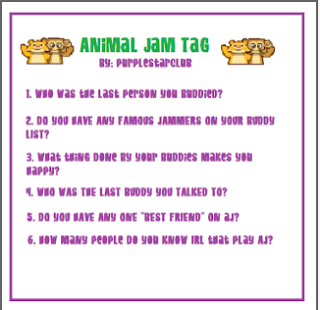 Since almost everyone has been tagged already, I tag AJKraft and anyone else who wants to answer these questions! 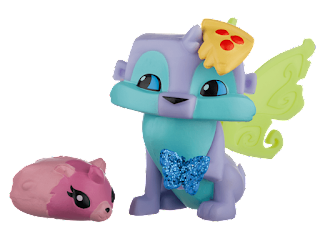 Next, the Animal Jam toys! Have you all heard the news? 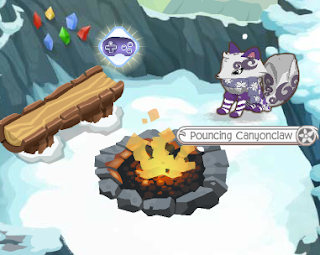 If you read The Animal Jam Whip, you may already know that an EPIC PIZZA HAT has been spotted in Jamaa! And I found this Phineas and Ferb GIF in my files along with this pic. But anyways, does that new hat look cheesy or what!? Makes me hungry, and I literally just ate! 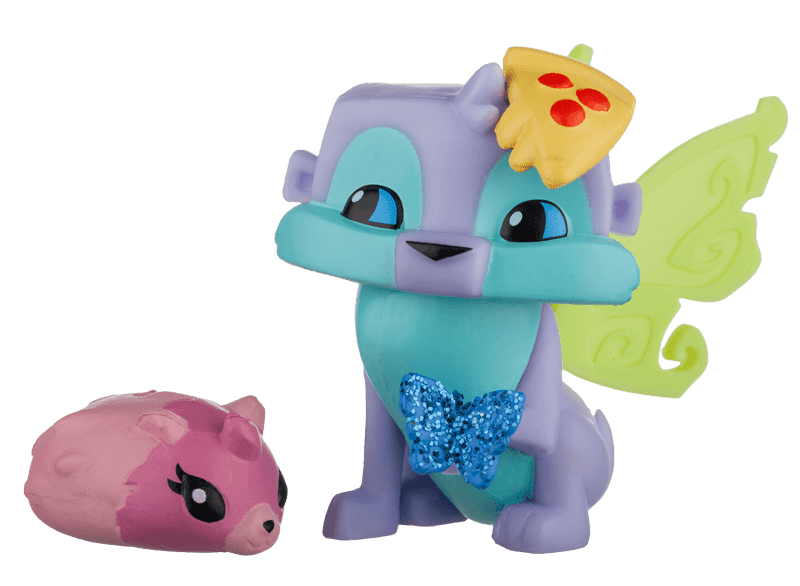 Makes sense that the Epic Pizza Hat would come with a toy otter with a pizza hat accessory, huh? I saw this guy on the back of the boxes, but realized it wasn't released yet. Maybe it's available now? I hope so, I love AJ otters! Guess what ELSE my sister found on Amazon!? Doesn't it just look amazing!? The Crystal Palace Den is one of my favorites, and arctic foxes are SO CUTE! Do my eyes deceive me, or do I see... A CRYSTAL MIRA STATUE!!?? I do, I do see one!! So THAT'S how you get them!!! I. AM. SO. EXCITED!!! How about you guys!? May wanna wait until this playset hits stores, because it's $50 on Amazon! Dang! There's also only 1 left. If you've got $50 to spare, go for it, and go for it soon! Like I said, it's on Amazon! Can't say Amazon has been good to me, so I'll be waiting a few months, I suppose. That's all for today, gotta get off my computer! I hope you all enjoyed this post! Oh, one other thing!! Since I didn't want to add this topic into the title and ruin the alliteration (XD), I'll just tell you to go to my den if you want to see a new Masterpiece which has just been approved! Remember to Party Hard, Be Kind, and Jam On, jammers!!! 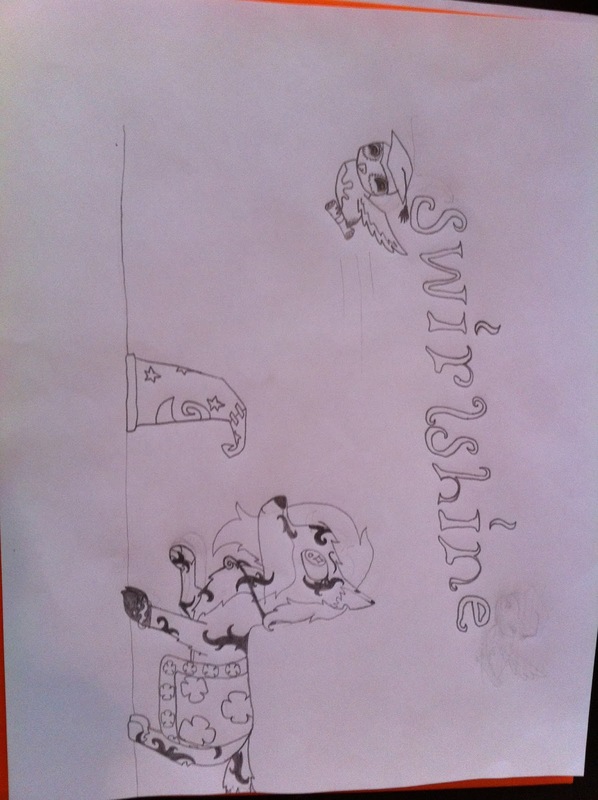 Swirlshine OUT! PEACE! 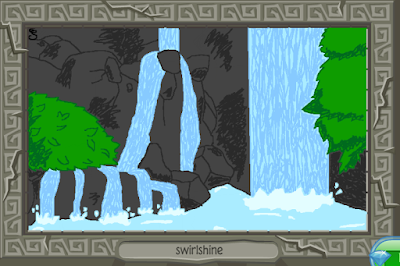 Today, I'm going to be talking about what I think are the three most mysterious lands in Jamaa. I got this post idea from Mt. Shiveer. It's such a pretty, calm place, so I visit it sometimes when I want to relax. 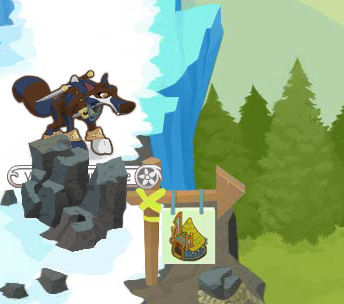 I did that just a few minutes ago, and I realized how many secrets the icy land has! But not just Shiveer! Most of the lands in Jamaa have some hidden thing that most may not pay attention to. 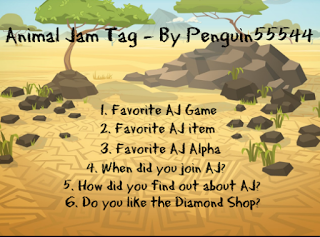 So, here are my top 3 most mysterious lands in Animal Jam!!! This one almost came out a tie between Kimbara and Appondale, but I realized that Jamaa is pretty small as it is. So, I chose Kimbara Outback! Why? Well, just look around! It looks as if some items were abandoned here, such as a wheel. And also, how did the Medical Center, bridge, and Outback Imports get there? Were they perhaps built by a secret animal tribe, living near Kimbara? I think they should make an adventure out of that! The background is quite interesting as well. I thought the blobs were parts of an ocean...a very...blobby ocean, but then I realized they were bushes. Oops. But look! It shows plains and rock formations beyond the land? 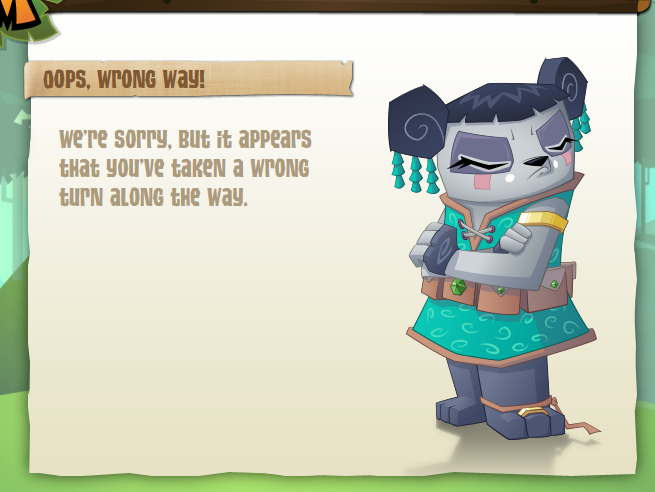 Could this mean a savannah-type land will be coming to Jamaa? I understand we've got Appondale for that, but it's rather small, don't you think? Still, Appondale is one of my favorite lands! But imagine a completely flat land, covered only by short grass, in Jamaa! There could maybe even be a secret shop in some kind of underground hole! I'd make only foxes, arctic foxes, and bunnies be allowed to go in it, since they're burrowing animals, you know? There's one other thing. Did you know that there's a secret, birds-only ledge above the Medical Center? You can perch on it! The land seems barren and abandoned. Why? Because everyone's either in Sarepia, role-playing, or the Township, trading. I love Kimbara, so please, visit this amazing desert land when you have time! We need to start up a Kimbara movement or something! Mt. Shiveer, no doubt, has some perplexing things about it. For example, the cave leading to Crystal Sands. SkyWatcher actually has a theory that there may be underground tunnels under Jamaa! It makes sense! Mt. Shiveer is nowhere near Crystal Sands, and the climates are totally different. 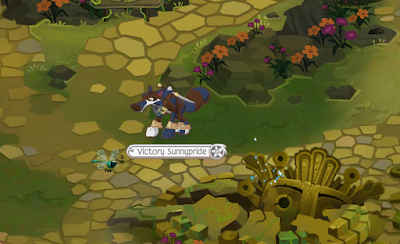 A lot of us bloggers think AJHQ should release little linking mini-lands, like Canyons Pathway. That way, it'd make more sense to connect Shiveer to Crystal Sands. There's also a vivid view here, like Kimbara! Those mountains stretch into the distance. Thing is, though, where are they from? Perhaps they belong to the land above Appondale? This bridge leads to Sarepia, again, huge climate change, but Sarepia has no pine trees, at least, not that I've seen. I think that these trees are surrounding Sarepia, meaning that there are, in fact, uncharted lands out there. The multiple caves, all but one, the Crystal Sands passageway, blocked off, are also a mystery. So is the frozen dino, by the volcanic "hot tub". Does this mean dinosaurs once roamed Jamaa? What would that be like? Maybe an adventure could show us! And don't even get me started on the ice! You can read about some "breaking the ice" theories right here! While we're on the topic of Mt. Shiveer, has anyone noticed that the log bench, usually put out around the Jamaalidays, has not been removed? It still sits by the fire pit! The Lost Temple of Zios is most likely the most historical land in all of Jamaa. Well, okay, it doesn't have any REAL history, but it does have tons of Jamaasian lore. Know what I mean? The tribal bongo music shows that this land is pretty ancient, and the rocky paths and stone buildings do as well. If you walk up by the left of The Chamber Of Knowledge, you'll see phantoms blazing through the sky, just like on Falling Phantoms. Kinda freaky, if you think about it. Basically, jammers are getting ambushed right on the other side of that bush. The cave, close to the Adventure Base Camp entrance, is where the nearby stream starts. But what's back there? A secret cavern? A secret land? Perhaps a Jamaasian tribe? The Chamber Of Knowledge is also quite mysterious, filled with ancient bottles, armor, books, and even a tapestry of Mira. There's also a trap door, which, though sealed shut, leads to the Basement Of Secrets, which you can get to by clicking on a certain spot in the forest under Appondale. And there you have it! My top 3 most mysterious lands of Jamaa! I really hope you enjoyed this post, and that you learned something new! Remember to PARTY HARD, BE CURIOUS, and JAM ON, everyone, and go explore Jamaa! Hi! It's the weekend, woo!!!! TGIF, am I right?! 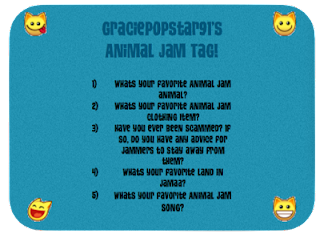 So, do any of you out there read the Animal Jam Story Books blog? It's a great blog, completely for AJ fanfictions! It's SO AWESOME!!! You see, CanineClaw AJ has been having problems with the blog being set on private for no reason. No one she, or Cookycupcake, knows, is doing this. Recently, Canine herself was somehow removed as an admin, meaning there may be no way to get the AJSB blog back. Maybe someone hacked her dashboard? 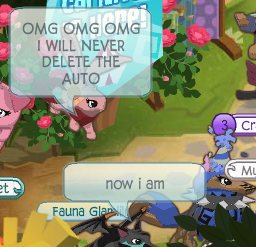 If that is true, RIP, Animal Jam Story Books. I will miss you. But what about the unfinished stories on the blog? Don't worry, because guess what? I'm going to make pages on this blog for those fanfictions! 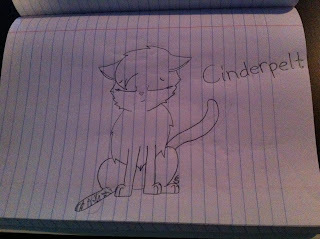 If you want your story to be continued, just comment on this post your story's name, and I'll make a page for it! So far, Jamaasian High will be getting its own page! I just made...THE BEST ART I'VE PROBABLY EVER CREATED IN MY LIFE!!!!! Yes, I used a reference picture, but I still really like the finished product! Correction: I LOVE THE FINISHED PRODUCT!!! I WANT TO PLAY AJ AND I'M ON THE AJ HOME PAGE, SO I DID NOT TAKE A WRONG TURN! Don't give us that look, Liza. I'm more mad than you right now. My First Day Of 7th Grade! Today, I went to my first day of 7th grade! I actually really like it so far! I'll admit, it WAS kinda hectic, but since I've been at the school for a year or two now, I know my way around a little more. And guess what? So far, my math teacher doesn't seem to be the type who gives tons of homework, which means I may be a lot less stressed this year! WOOOO! But I can't judge 7th grade on the first day! I gotta get to know all my teachers first. Hopefully, though, all will work out just fine! But I'm making this post to tell you all about how I'll be doing things now. If you think I'm half-quitting for school, I'm not. I can't imagine being away from AJ, and my blog, for the whole school year! I'll still be posting! But, as you can probably guess, I doubt I'll be able to post WHENEVER I want to. Some days of the week may be too busy for me to do this. So, from now on, until the summer of 2017 comes around, I will only be FOR SURE posting on weekends. I may throw in a post on Wednesday or something if I have time. Again: I won't be inactive, at least, not for long! Hopefully I'll have less homework this year, and after I finish it, I can get on AJ. I'm not sure yet, though. However this school year works out, I'll find a way to post and visit with you all! I promise! I've been meaning to make a post like this for a few days now, and the day has finally come! This one is the oldest of the bunch, though only by about 3 months. It's my wolf, Flora Daisypride, and my owl, Purplewings! 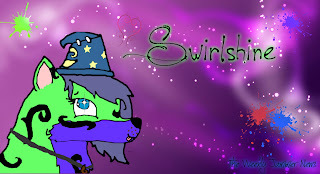 It's kinda made to look like an intro or signature-thing. I don't really know. One of my favorites, though! Next up, some Warriors art! I'm sorry Canine. SPOILERS AHEAD!!!!!!!!!! Don't read if you don't want to know!! This picture kinda shows how she feels about it. She's looking regretfully at her injured leg because, well, it kinda caused her destiny to be flipped upside down, you know? Lastly, two recently created (literally, I made one about 10 minutes ago) Masterpieces. The first one is a replacement. Because SOME PEOPLE *cough cough, AJHQ, cough cough* think one scar is a reason to delete a great work of art! 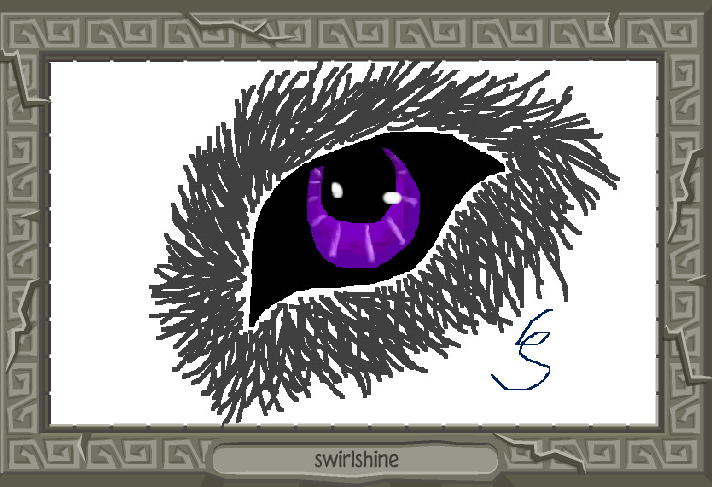 Good thing that Masterpiece only took me about 10 minutes. 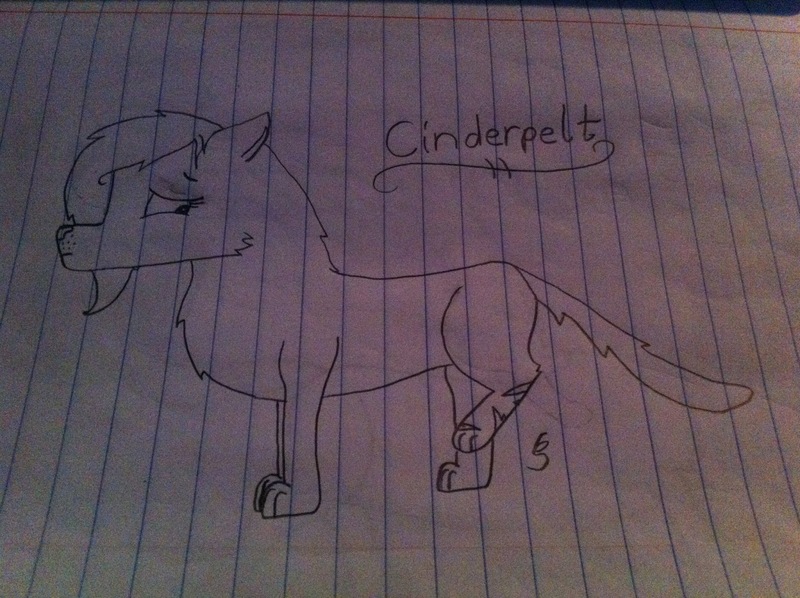 I'm sorry, I'm obsessed with Cinderpelt, aren't I? It's because I watched this AMAZING Warriors animation about her! I would make a link, but it does have spoilers and other stuff that some of you may not want to see. 1. Go to The Animal Jam Spring, and scroll down until you find the post including it. It should be only one or two posts down. Like I said, don't watch if you don't want spoilers! It also sorta kinda...has some violence. Not like fighting, but I guess it counts. Normally, I'm not a fan of videos with that in it, but it's just SUCH A GOOD ANIMATION!!! I love this one as well. At least THIS MASTERPIECE was approved. 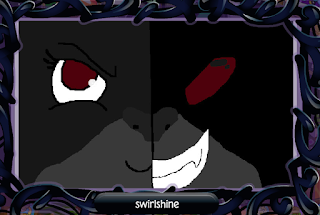 Canine your suffering is finally over I'm sorry. Anyways, that's all the art I've got for now! Do you guys like my art? Should I do more art posts like this one? Tell me in the comments below! Until next time, remember to PARTY HARD, BE ARTISTIC, and JAM ON! AJHQ apparently cannot deal with one scar on a cat's cheek. Alrighty. Let's not do all this random-intro nonsense this time. I'm just gonna get right into it! Here we go! I was in 4th grade I believe, when it happened. 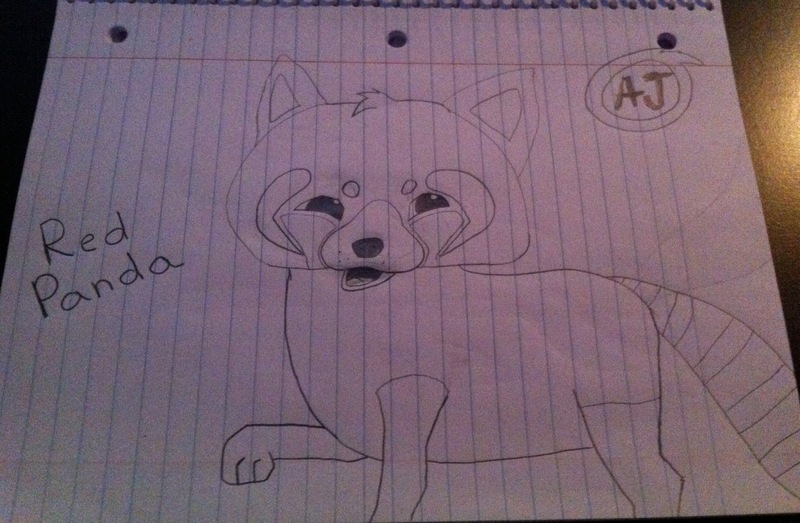 There was a girl at my school, who I suppose I'll call A in this story, who played AJ like me. One day, at lunch, she asked me for my password. I honestly don't remember why she wanted it. Maybe for no reason at all. I dunno. I refused to give it away, but she kept asking, begging, pleading, and promising that she would NEVER give it to anyone or use it. Finally, peer pressure got the better of me. I wrote down my password for her, and told her to keep it in a place that no one would find it. A day or two later, I logged onto AJ. I played around Jamaa for a while, trading and what-not. Finally, I decided to go to my den. 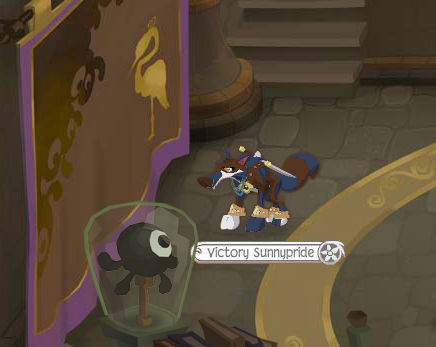 When I did, I realized that my prized Epic Wolf Plushie was not in the place it should have been. In fact, NOTHING was in that spot! 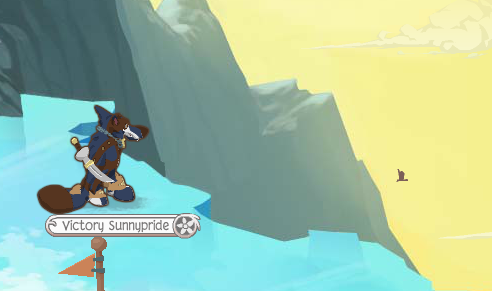 I checked my Inventory, guessing that it was just a glitch, and my den hadn't fully loaded yet. 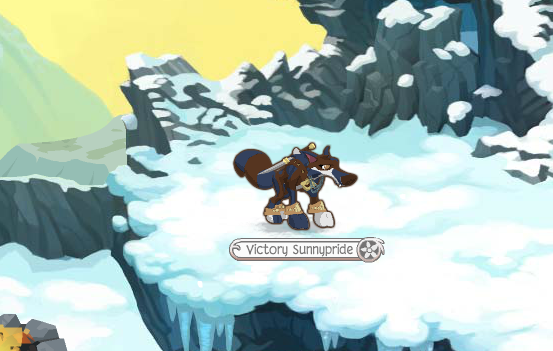 But, after checking and re-checking, I still didn't see my Epic Wolf Plushie. Panicking, I tried everything I could, but the wolf never appeared. I checked my Clothing, and my recently-earned Rare Heart Locket was gone as well! I could already tell I'd been hacked. And I could already guess who had done it. I texted my best friend, telling her that A had hacked me. She messaged me back, saying "A says she didn't do it." I was skeptical, but my best friend said that A swore she didn't do it. I e-mailed AJHQ that night, telling them what I lost and begging them to please give the 2 items back. Honestly, all I wanted was the Epic Wolf. It was my favorite item back then. I also changed my pretty-easy password to a longer one. When I saw A at school again, she told me that it might have been her older sister who had taken the password and hacked me. Thing is, though, she said her sister didn't PLAY AJ! I asked about that, and A said that her sister just might have done it for fun. I never got those 2 items back. I was lucky that nothing else was taken, but sadly, my amazing, adorable Epic Wolf Plushie was gone forever. 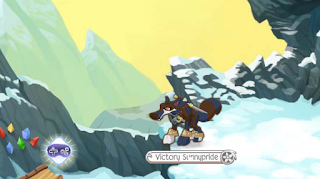 I eventually earned the Heart Locket back, but to this day, I still miss my Epic Wolf, whom I could not replace. Let this me a lesson, to you, and myself: Don't give out your password to anyone. Even if they promise they won't use it, chances are your plan to keep your account secure will backfire. Remember to PARTY HARD, BE SAFE, AND JAM ON until my next post, everyone! Hey everyone! This isn't a real post. I just wanted to show you all what I made! I'll be using this one for a while now! Skit time! You know you love 'em! You Guys: Um, it's not even close to morning. Me: Oh. Good afternoon, everyone! You Guys: Nope. Past that, too. Me: Fine, then! Good NIGHT everyone!! You Guys: Good night! See ya tomorrow! Anyways, how have you all been? I surely hope you had a better day than I did! I had to get up at, like, 8 in the morning, for a volleyball camp that I'm going to for the entire week. But, I had a doctors appointment, so I had to leave an hour early. Had to get two shots, one on each arm, kinda under my shoulder. Why that detail matters, I do not know. I really need to stop saying tetanus shot...OH DANG IT! After that was over, my mom dragged me off to another place to get an x-ray of my back. My mom has a really bad back, in fact, it was even curved! She also can get migraines, and she's got pretty bad eyesight. My eyesight's pretty bad, I gotta admit. I have glasses, but I don't normally use them. I actually like them, but I just don't like keeping track of them. I've also gotten a couple migraines in the last few years. You know, the really, REALLY bad headaches? But, getting back on topic, I had to put this blue robe-thing on for the z-ray. Then, the lady doing the x-ray taped a little metal ball to my back, and I had to stand still with my head up and not breathe as the x-ray took pictures. Wasn't exactly...fun. I was going to have to go shoe shopping, which I hate almost as much as jeans/shorts shopping, but thankfully, my mom said we could do it tomorrow! Oh my...you're kidding me. YOU'RE KIDDING ME. I just typed z-ray two more times!!! What is wrong with me!? When I got home, I had to practice a song for a choir performance that I'll be doing tomorrow. It's quite a high song, almost too high for me to sing, but I switched from soprano to alto, so it's a bit easier! Good news is, I get to sing the Cup Song this week too! Sweet! Something in my range, AND I like the song! Why is it just called " Cup Song", though? I mean, I know there's a cup thing that goes with it, but honestly! Give the song a real name! I think it should be called " When I'm Gone", but it's not like I can change song titles. Well, that's my story! Sorry I babbled on for so long! How about we get onto the part of the post that's NOT about my day? First up, we've got yet another tag, made by Penguin55544! Awesome! I love doing these! Each one is different, and that's why they're so fun! I was gonna make an AJ tag, too, but I figured that we've got quite enough tags going around in the blogging community for now! I will do one sometime soon, though! Let's get going on that tag! 1. Overflow was one of my favorites, since it's great if you need some quick gems! But, since it's not exactly super fun, I'll be going with Best Dressed! It's challenging, fun, and there's no telling who'll be winning the next round! Okay, I already can't decide. So I'm doing a favorite item for each category. Guess what my favorite clothing item is? Guess! If you guessed Peacock Feathers, you are correct! Honestly, I'm going with Masterpieces! 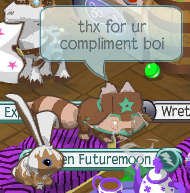 They express me, they show how I've improved, and plus, they look pretty swagalicious in dens! 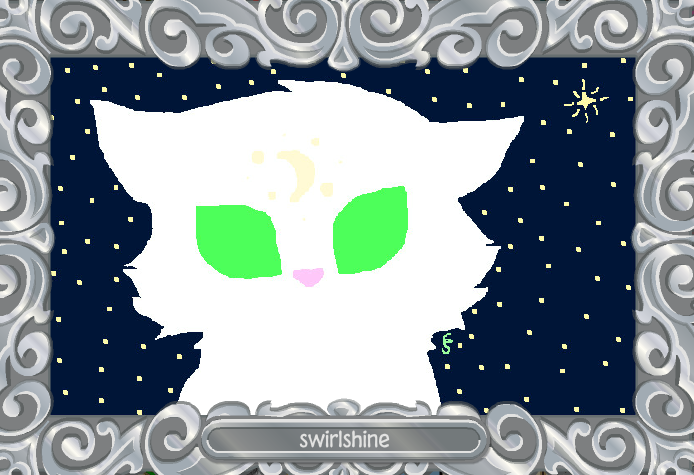 I also LOVE seeing other jammers' Masterpieces! 3. 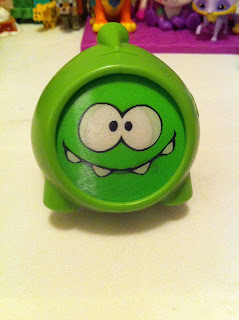 His name starts with a "Gree" and ends with a "ly"
4. Does this answer your question? 5. Ooo, I've never been asked this before! Wait a moment. No, this isn't right! Yes, I first found out that AJ existed by reading that magazine, but I JOINED AJ because of my best friend! I had a sleepover party that year, and the next day, my friend asked if I wanted to see her "Animal Jam". 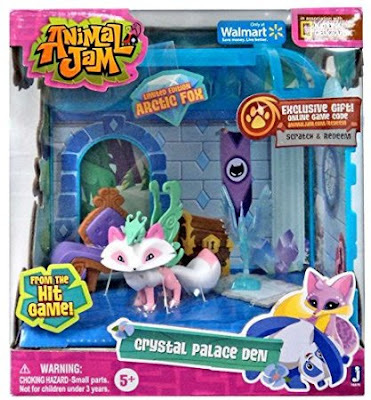 Call me crazy, but I thought Animal Jam was a DS game at first. I'm serious. When I found out that it was a computer game, I instantly liked it! A game where you could basically BE wild animals! Sign me up! I believe I DID sign up the next day. I don't exactly LIKE it, no. I mean, it sells animals, which I'm grateful for, and dens, but it's honestly not really needed! 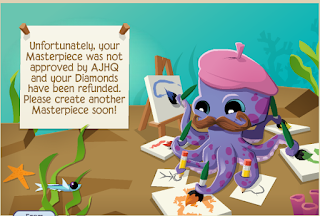 If AJHQ had stuck to gems, they're be no need for the Diamond Shop. I just realized I didn't tag anyone for yesterday's tags! Oops. I'm a lazy bum, though, and I don't feel like going back on more blogs to figure out who's already been tagged and who hasn't. So, to satisfy you all... I TAG EVERYONE WHO HASN'T DONE THOSE TAGS YET! Alrighty! What's next on the topic list? This isn't as much a topic as it is a shoutout, but oh well. 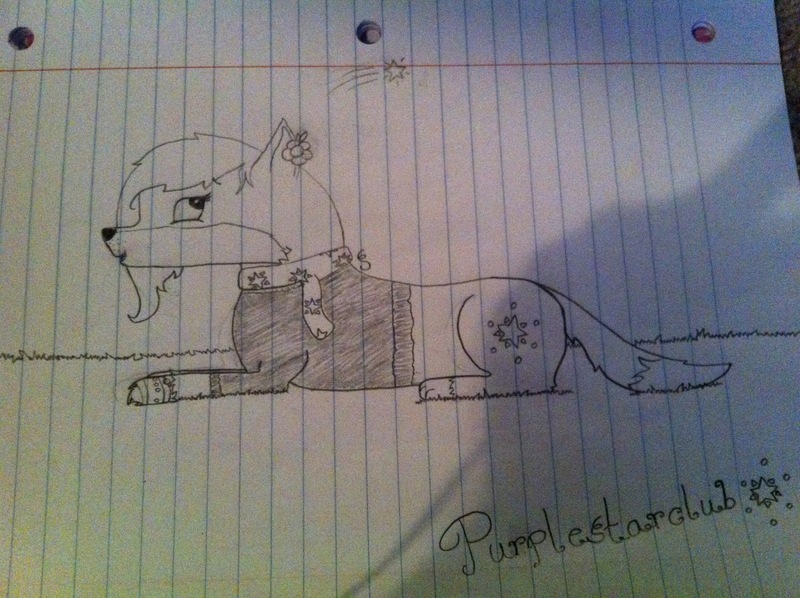 A HUGE thanks to Purplestarclub, for making me this A-MA-ZING drawing of my wolf! Honestly, I see no flaws. I love it!! 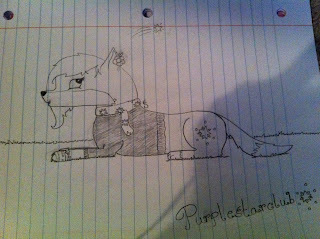 I'll be posting a little something I created for YOU very soon, Purple!!! Oh! 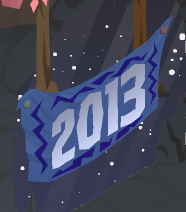 By the way, I'm working on a pretty big a piece of art for all my friends and blog contributors! If you don't see yourself on this list, please be sure to let me know so I can add you! We're down to our LAST topic of this post! Finally! So, as you all probably know, I LOVE creating fanfictions. I'd love to post them all on this blog as new pages, but that'd be way too many pages! Then I thought: Why not make a whole new BLOG just for my fanfictions?! Now, I'm aware that this idea is not exactly...original. 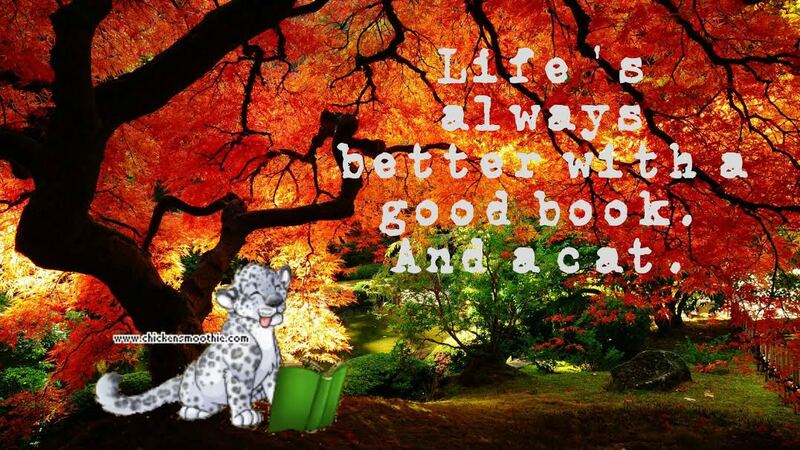 CanineClaw AJ and Cookycupcake already did this, with a blog called the Animal Jam Story Books. But this little story-blog would feature my stories, and mine only. Yes, I will give shoutouts if you guys have any good fanfics you want me to mention, but no one will be posting on this blog except for me. I don't exactly know how to add authors, anyway...To be honest, I don't want authors anyway. I love running the WJN as the one, sole author. It just feels more...free. Know what I mean? Anyways, I think the new blog would be called " Swirl's Stories"! Got a nice ring, huh? Lol! I really hope you enjoyed this post! 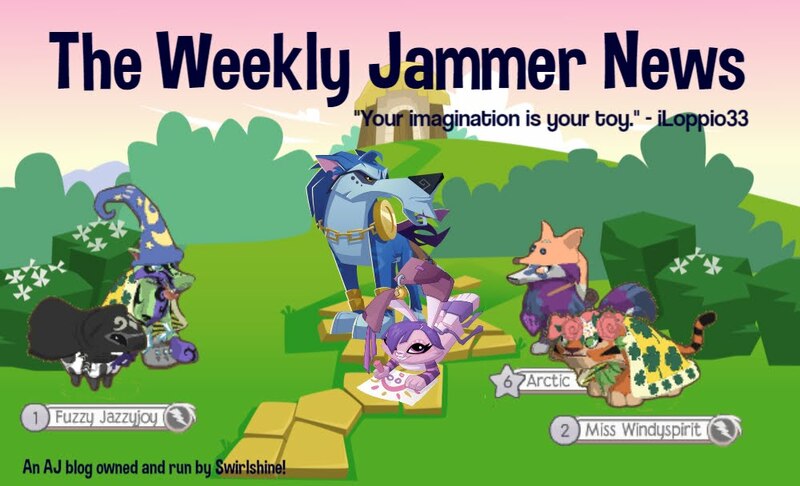 Remember to PARTY HARD, BE KIND, and JAM ON, and stay tuned for more info on The Weekly Jammer News! 2 Tags, and Some Art! I had to. My sis is blasting "Discord" right now. It's actually a great song!! 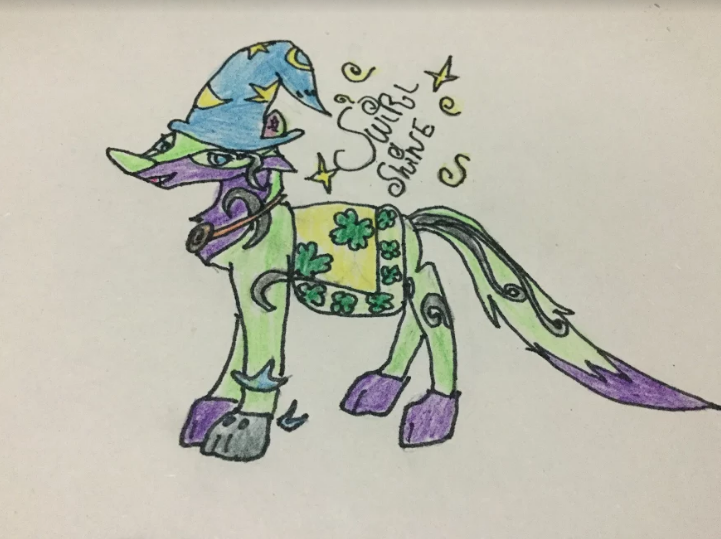 Yes, okay, it's MLP themed, but I'm sure you could always find a lyrics version! Anyways, recently, I was tagged by Lostfairy on 2 tags! Okay, so, I wasn't specifically tagged, but she said anyone could do it, and I'm anyone! Right? I think it was Princessbg. 3. Honestly, a good chat is all I really need! I do love when they send me gifts, though! 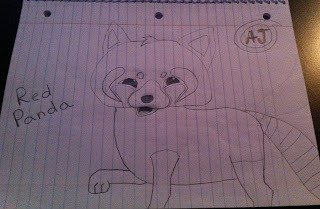 Thanks, CanineClaw AJ! I especially love custom made art! Hint hint. 4. Mmm, that's tough. Not including Jam-A-Grams, I think it was Cookycupcake! Including Jam-A-Grams, it'd be Lostfairy! 5. No! I could never have just one! HOW DARRRRRE YOU!!?? All you bloggers are my best friends, and I have another buddy, rachelcatpaws, who is another one! 6. I believe I know 3 or 4 people IRL that play AJ. My two bffs, and two others who go to my school. Thanks to PURPLESTARCLUB for making that tag! Now for another! 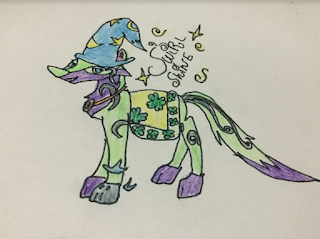 This one is by GRACIEPOPSTAR91! 1. I've got three: Deer, Tigers, and Cheetahs! 3. Nope. My sister has, but that was because she was younger. I started AJ at about 9 years old, so I knew better then to let people trick me out of my items. Not that I'm saying you all are dumb. I'm not, I swear! I swear on everything I own! Sometimes, if I have an unwanted item, I test people by sending it to them, and seeing if they're a scammer or not. Okay, I USED to do that. Guess I'd have to say Appondale and the Temple Of Zios. The Temple is cool and mysterious, while Appondale has some pretty funky music and cool scenery! This one's my favorite! 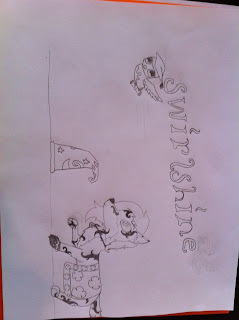 Does it look realistic-ish to ya? 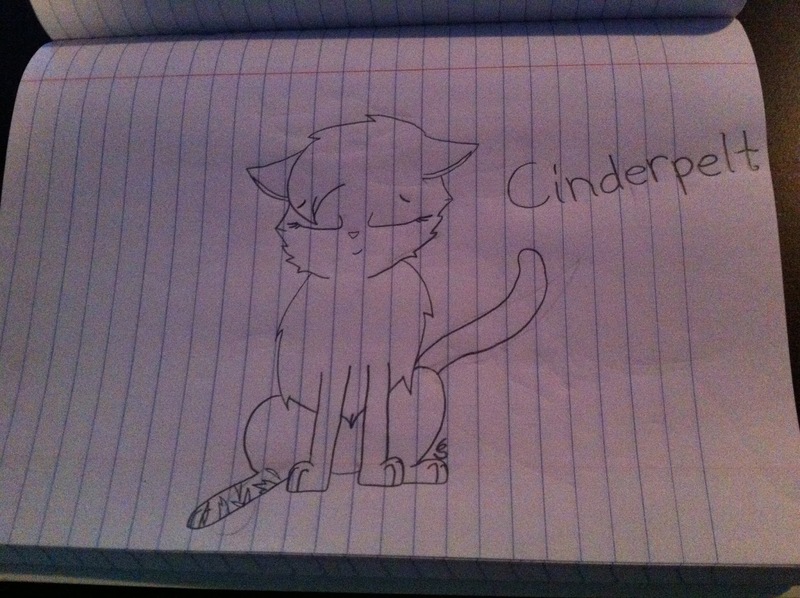 This is one of my Snow Leopard. Half shows her good side, half shows her evil. Hopefully I can post tomorrow! See you then! I AM LITERALLY THE HAPPIEST JAMMER ON THE PLANET RIGHT NOW!!!!!! Know why!? I GOT THE PEACOCK FEATHERS!!!!!!!!!!!!!! But this is AMAZING! Now I don't have buy 19 more Adopt-A-Pet houses!!! I am SO DARN EXCITED!!! Thank you SO MUCH, itsbre, for trading me this item! 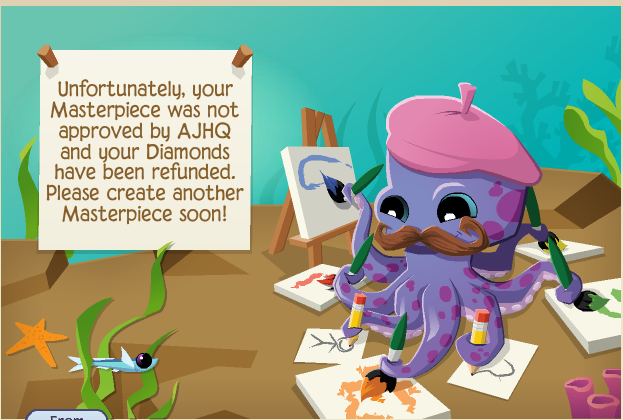 Okay, so I lost 10 items for only 1...but COME ON, IT'S PEACOCK FEATHERS YOU GUYS!!!!!!!!!!!! Here's the look I made for it on my owl! It's supposed to look like a real peacock. Yeah, okay, so it needs a little work. I'll fix that right now!! See you later, everyone!!!!!!!!!! Hi again, my beloved darlings! Wait, no, not darlings. Jammers. Yeah, jammers, I meant jammers. Honestly, all I wanted to do was at LEAST check my blogs, but I couldn't. So I was sorta in a bad mood about that for a bit. When I turned the radio on in the car, though, when we were leaving, I felt happy again! I guess all I really need is a good tune to get me back in the groove, huh? It's amazing what music can do! JAMAASIAN HIGH IS ABSOLUTELY THE BEST STORY EVER!!! You can read it right here, on the Animal Jam Story Books blog! I'm literally just talking about random topics back and forth. Gosh, I feel like all those other AJ bloggers are so orderly. They post daily, and not about weird things, but about stuff actually happening in AJ! I say I'm organized, but look at me, posting all this randomness whenever I want. But hey, I like being random. I like it, and I'm sticking with what I like. :) Plus, it's really who I am, ya know? Sorry for not posting about AJ much lately. To make up for it, how about some... RANDOM COMMENTS PEOPLE SAY IN AJ!! That grammer though. Yes, anyone can send you buddy requests. Er...if you don't care, why are you typing about it? Now, a... friendly...conversation between a bunny and I.
Hehehe. I'm the raccoon. Someone else was asking what a Rare Bunny Hat was worth. I said a Rare Bunny Hat. Come on, it's true! 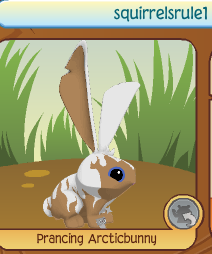 But then, some bunny goes " its worth nothing, its a monday rare". So I said that THEY were a "monday rare"! BUUUUUUURN! Hahaha! MY comebacks are amazing. 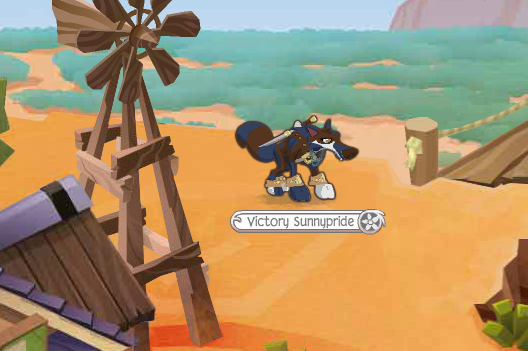 If you wanna know why I called her " SMELLY SQUIRRELS", it's because her username was squirrelsrule1. Spam her JAG inbox. XDDD! But guess who comes up with yet ANOTHER comeback? You did NOT just go there! I took it as a compliment, though. And I need to find you a therapist, because you want to "dat" on a kids game. Hehe, yeah. Clark would most likely slap you back. Okay, I would most likely slap her back. Clark, being more mature, would probably ignore her, or kick her out of...the place where she slapped him. It wasn't until I got to the falling phantoms on my laggy computer that I realized I wanted to join this person. Sorry, Clark Stacey. Luckily, though, I finished the adventure on an Apple computer, which ran pretty smoothly! And, " i quit the falling phantoms". Such grammar, XD! I bet those " little 10 year olds" are discussing their battle plans right now. This bunny was so happy that she got an "auto" from a random jammer. #2. Why would you cry because no one's trading you?! This two people, at this AJ hotel I went to, were screaming at each other half the time I was there, because they both wanted the same room. I think it was a pig dressed like a turtle, and a colorful koala. I'm guessing the koala was the " piece of candy"? Yeah... so, I was at that hotel, and I was sharing a room with an arctic wolf, Princess, and 2 dogs. Yes, I know it sounds weird, but Princess decided to adopt them, not me. Plus, it's AJ! Why not? So anyway, we were having a good time, even inviting another "dog", shown above (with her head in the fence) to join our little family. Then, after another fox, who was also roleplaying a a dog, showed up, one of the original dogs said " no, we have too many dogs already! 3 is enough." Her sister-dog got mad, and that's when the chaos started. Next thing you know, I've got two dogs who-knows-where in the hotel den, one crying because " her sisters were all gone", and one threatening to leave because she hated Princess. I tried to sort out the drama, but it didn't work out so well. 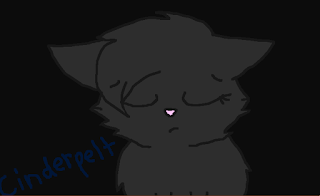 My good buddy, Rachelcatpaws, wanted to visit with me, so I ended up butting out of the never-ending drama by saying that she wanted me, and then leaving. I also ended up unbuddying Princess, because I saw her screaming at the 3rd dog, Rose, to trade her a fox hat. Plus, every time someone walked into our room, she put, in all caps, " GET OUT". I think Princess was the one saying the comment in the picture directly above. Maybe Rose was mad because she didn't have a "spike" as a collar, and all the other dogs did? I really don't know. Oh yeah. The dogs were also SUPER unrealistic dogs. 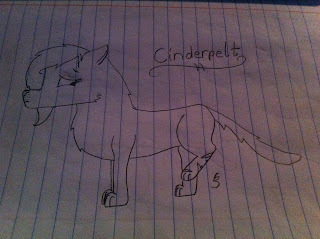 When I roleplay as a dog, I say things like " : Barks happily:", " : Pads off:", " : Yips in confusion:", stuff like that. 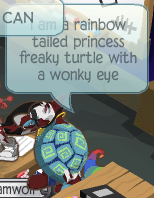 When THESE jammers roleplay as dogs, they flush toilets, leave the room whenever they want, and constantly go visit this sloth dressed like a turtle. They also thought that putting "woof" before anything they said meant they were speaking dog. The rules literally said that you must be some kind of monster, and be evil, otherwise, you get kicked out of the school. So I became the most terrifying monster of all time! After getting mad at me for sitting at " her desk", which wasn't hers at all, because she never sat at it, she locked me out. Rood. And lastly, here's a comment from a wolf at that very school who said she was the wolf who raised the moon. Hope you enjoyed that! I certainly love sharing these random, weird stories with you all! I hope at least one of these gave ya a good laugh! Guess I better be going! Remember to PARTY HARD, BE KIND, and JAM ON until my next post!